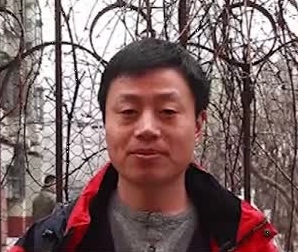 According to sources close to him, Du Bin (杜斌), an independent writer, film maker, and formerly a photographer for the New York Times, was confirmed on Sunday to have been criminally detained on May 31 by state security police in Beijing. He was charged with “printing illegal publications” and detained in the detention center of Fengtai District, Beijing. Du Bin has been missing for days and details of his “disappearance” emerged only in the last 48 hours or so. Prominent Beijing-based dissident Hu Jia (胡佳) told media that more than ten security police –only two of them in uniform and the others in plain clothes — raided Du Bin’s rented apartment on the night of May 31. His girlfriend last spoke to him around 9pm that day, and then could not find him anywhere for a week. When she finally learned of his detention, she burst into tears, thankful that he is still alive. Sources said that the police searched Du Bin’s apartment and took books and videos about petitioners and the June 4th student movement. 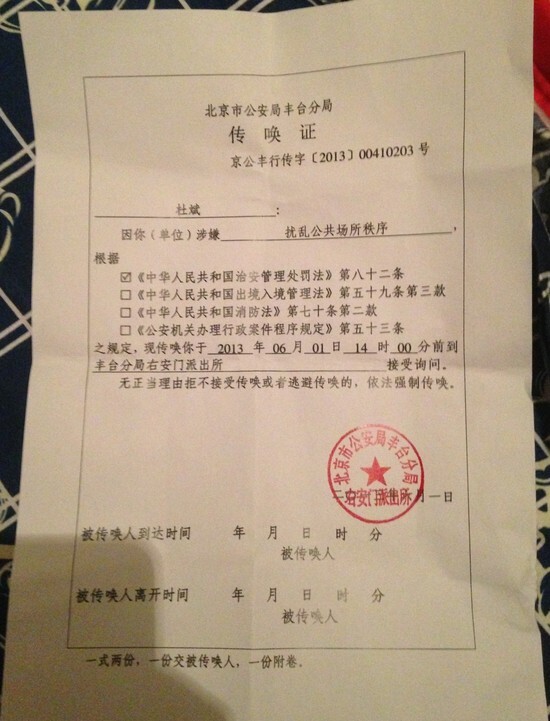 According to a tweet from prominent rights lawyer Teng Biao (滕彪), a warrant for summons was found in his apartment. Also found there was a search warrant with the seal of the Fengtai District Public Security Bureau which indicates that two police officers, Liu Yang (刘洋) and Li Qiang (李強), conducted the search. But, there are no witnesses, nor Du Bin’s signature. No one has seen a notice of criminal detention. Unsigned, mis-dated warrant for summons found in Du Bin’s apartment. Du Bin made the documentary Above the Ghosts’ Heads: The Women of Masanjia Labor Camp, in which victims tell about the torture they suffered in the camp. While the film could not be shown inside China, it was released in April in Hong Kong. Du Bin also authored and published at least two books in Hong Kong. One of them, The Tian’anmen Massacre (《天安门屠杀》), was released in Hong Kong at the end of May shortly before the 24th anniversary of the democratic movement in 1989. Friends believe that Du Bin’s arrest has to do with these activities. Born in 1972, Du Bin has tracked and filmed petitioners’ life stories and their struggles for years. He has over the years collected a large quantity of materials related to the Tian’anmen movement from used-book markets in China. He had been a contracted photographer for the New York Times, but since 2011, the Chinese Foreign Ministry has refused to issue him a permit for working for the NYT. Friends have since gotten hold of Du Bin’s sister and learned that the family has never received a notice of his detention. The renowned rights lawyer Pu Zhiqiang will be providing legal assistance in Du’s case. 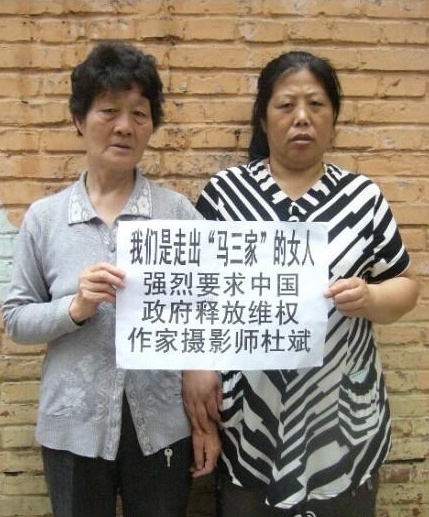 Masanjia victims, whom Du Bin filmed, are indignant about his detention. A signature campaign and a protest are planned to demand his release. According to a rough statistic put together by blogger, activist Wen Yunchao, there have already been close to 30 political prisoners this year, an astonishing number compared to previous years. 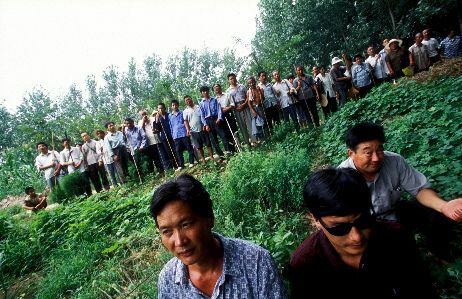 A photograph of Chen Guangcheng and villagers, by Du Bin, for the New York Times. By China Change in Reports, Rule of Law on June 10, 2013 .